Apparently someone downloaded the files and bothered to rate them, so it was about time I updated these really. In making mods we primarily learn by frustration until enlightenment is reached Unless we meet someone who has run into the same frustration before and feels generous enough to spare you from it. So I finally got this one to a state I feel comfortable assaulting you with It is a script to generate .pal files from BG II gradients. When editing item or paperdoll colours, you won't have to start up the game to see if it looks horrible -- just put in your colours and load the resulting palette in BAMWorkshop (2). It has a GUI for previewing and saving and everything. It even has a snazzy icon! A look at BAMWorkshop I and BAMWorkshop II and how to cope with their numerous bugs and quirks. Everything you want to know (and don't want to know) about working with character animations. 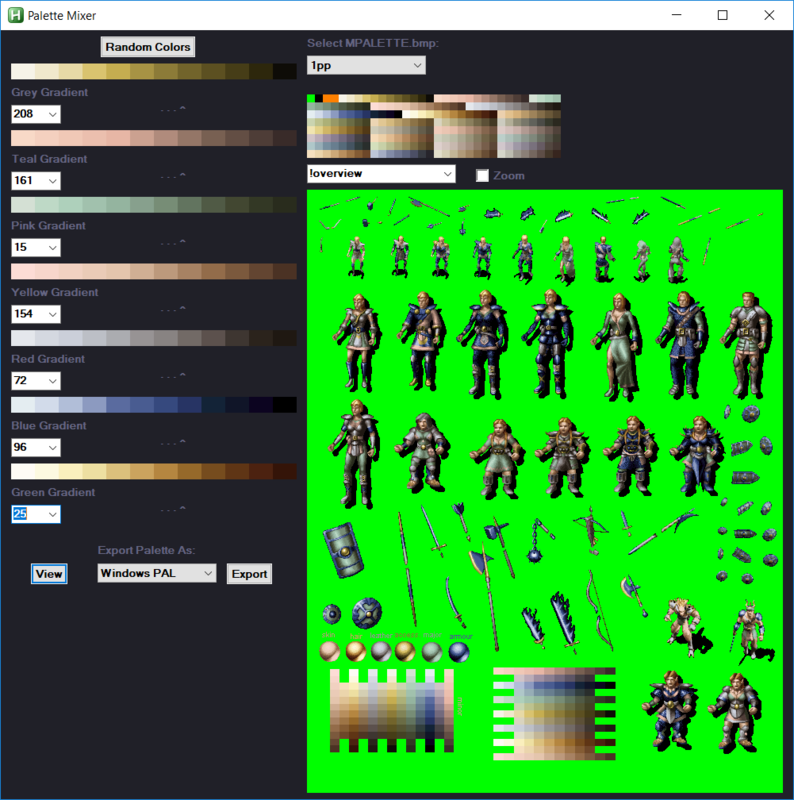 A look at Infinity Engine standard palettes. Comparison between the PLT and BAM file formats and their benefits and disadvantages. Edited by Erephine, 24 November 2008 - 04:01 PM. Are these still available? Does anyone still have them if not? I asked avenger years ago to add something like this to DLTCEP, so I don’t have to keep reloading bg to see my changes. thats them, thanks. google and shs search keep leading me to the same useless page. now to see if this helpful. Ideally the palette generator would dump the new palette directly into the BAM or BMP for viewing without having the additional steps of importing the new PAL palette in BWII. I could probably forcibly decompile the AHK EXE, rebuild it, and implement the necessary changes, but I have other priorities for a while. I'll consider adding it to my tentative to-do list, but how much use would such a tool really get? Truly, it might only be a tool for the few, the proud, the elite. But it might also gain you divine ascension should you so choose it. What other priorities do you have, out of curiosity? bst and updates to the other tools I mentioned are at the top of the list ATM. BEHOLD, for I am your new god! My worshipers may tithe with Scotch . I borrowed a few pictures and the general look of the GUI from Erephine, but the underlying code itself is nearly 100% original. Awesome. I'll try to rustle up donations for a bottle of Clan MacGregor. - but it looks like there's none left anywhere now. Surprise! There's still some on Amazon, although I see the price is starting to creep up. Mind you, I didn't pay much less than that, last year. Damn, if I had a bottle of that I'd have to put it up and bring it out once a year on my birthday for a sip. Otherwise it would disappear entirely too quickly . It would go in my closet right next to my unopened bottle of George Dickel 17 that I intend to sell in 30 years . On the off chance anyone is actually going to get some use out of it, I am open to improvement suggestions on the Palette Generator BTW. The colors of a paletted creature or item animation can be set directly in the CRE file at offsets 0x002c thru 0x0032, or using Effect Opcode #7 (0x7) Colour: Set Character colours by Palette either attached to the CRE or ITM directly or via applied effect (such as a spell). Traditionally, one would make a change to the CRE's or ITM's color then load the game to see if it looked right. If it wasn't what you wanted, you'd exit the game, make another change, and repeat. This tool will let you scroll through all possible color gradients for a given game for each color slot, and instantly render how the result will look in the game. It comes with a handful of multiple image examples (like the overview in the screenshot above) from Erephine, but I have also included all of the paletted paperdolls from ToSC. You can drop any images you want in the /res/paperdolls folder as long as they are 8-bit uncompressed Windows bitmaps that maintain the same palette order of the original paletted animations. Hmm, so if I have a custom dagger and want to decide what colour to assign to weapon head, weapon grip and so on all I had to do is to drop respective dagger paperdoll to /res/paperdolls and test all the colours while seeing in realtime the effect of my choice? That is so cool I don't have words. Thank you Sam. Yes, and the ToSC paperdolls for the dagger are already included for the various heights. They are WP*DDINV in the DropDownList next to the Zoom CheckBox. Well, does the tool use a current in use color palette schemes or some standard palette series, and if later, which one, an extended or not extended one? As I am aware that there should be a difference. Don't ask me what though, the answer would I give might involve numbers of palettes, say 2, but nothing else. It reads the "palette schemes" directly from a MPALETTE.bmp file (just like the game does). I have included this file from BGIIEE, IWDEE, PST, PSTEE, SoD, ToB, ToLM, and ToSC (renamed to the game from which it came, for clarity). I have also included the three from 1pp Extended Palette Entries, plus an extra one containing the 7 color gradients from the original "paletted" animations that can be used to closely simulate the "original" paletted look. You can switch between any of them from within the GUI, and you can even drop your own into the \res\mpalette folder and restart the utility. Assuming it is formatted properly, it will show up in the list. Edited by Creepin, 21 November 2017 - 01:02 PM.